Place used cards into a discard pile face up next to the draw pile. If the draw pile is ever empty, shuffle the discard pile to form a new one. Be the first to reach at least 100 points worth of words without going insane. 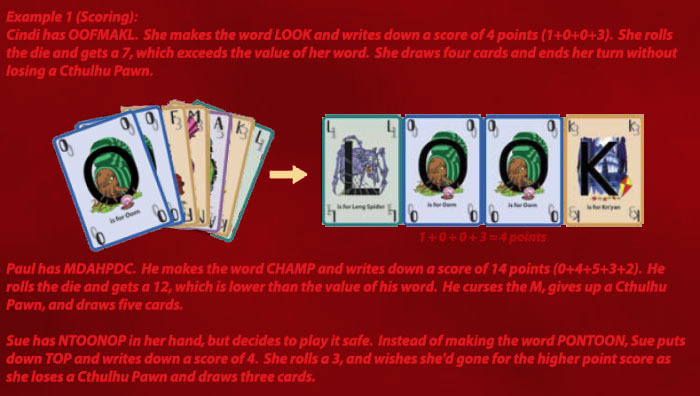 Form a word by displaying cards from their hand face up on the table (alternatively, a player may instead discard all of their cards without scoring, draw back to seven, and end their turn). Score the word by adding the numbers on the cards. Each card's value is determined by the number of angles that the letter contains (so a "C" is worth 0 points and a "A" is worth 5). Add the score to the player's current total and write down the word. That word may not be used by any player again this game. Roll a sanity check. In a Sanity check, the player must roll equal to or higher than the value of their word on the 20-sided die, or they will lose one Cthulhu pawn. A roll of 20 is always a success, no matter what the value of the word is. Regardless of the outcome of the sanity check, the player still scores for the word (unless it would bring them to 100 or more points). If a player loses their last Cthulhu pawn, they are out of the game. Draw back to seven cards. If the draw pile is empty, shuffle the discard pile to form a new one. A player may form any common English word of three or more letters. The plural version of a word counts as sperate from the singular. Players may not form proper nouns (Dave, London,..)., abbreviations (blvd)., acronyms (NASA), or contractions (she's, don't). No word may be used more than once by any player per game. If a player forms a word that bring them 100 or more points, they must succeed at their Sanity Check in order to score. If the Sanity check fails, they score 0 points. If it succeeds, they win the game. 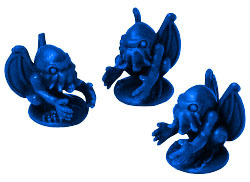 A player may also win the game if he/she is the only player left with any Cthulhu pawns. A player with only one Cthulhu pawn left may be allowed to make any word out of any number of letters and score for it (still rolling a sanity check to keep their last Cthulhu pawn), whether or not it is gibberish. Unhinged folk can believe anything is a word. 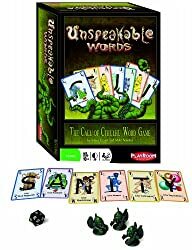 When a player discards their entire hand instead of making a word, other players may examine the discarded letters for words. 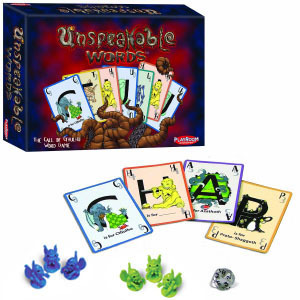 Any other player may force the discarder to form a legitimate word from those letters, rolling and scoring as normal. 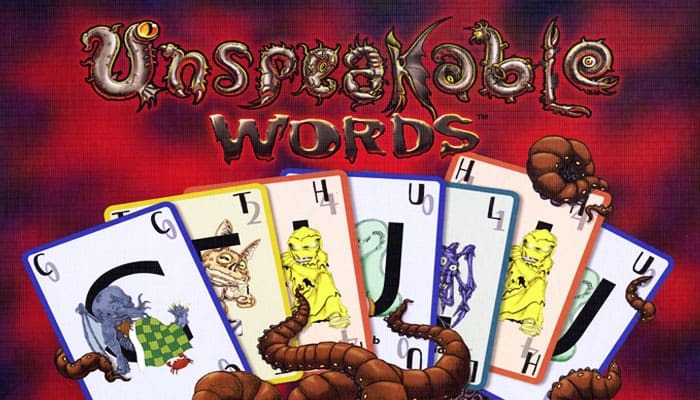 If several players point out words that can be created, the discarding player must form the highest-scoring word out of those letters. After that, the player draws a new hand. When a player discards their entire hand, they may roll against the total value of the hand. If the player rolls higher than that value, they regain a Cthulhu pawn. If not, nothing happens. No one may have more than 5 Cthulhu pawns during the game. Once a player reaches 100 or more points, each other player gets one more turn in which they have the opportunity to beat that player's score. The player with the highest score wins the game. If two or more players tie for the highest score, the one who reached their final score first wins the game. In other words, it's not enough to simply tie for the high score, a player must beat it in order to win.